Hooded police officers detain a man in Saint-Denis, near Paris, Nov. 18, 2015. One suspect still holed up in Saint-Denis apartment may be Abdelhamid Abaaoud, possible mastermind of coordinated attacks that killed 129 and wounded more than 300. A police raid in a Paris suburb ended after seven hours Wednesday with two people dead, seven arrested and the fate of the suspected mastermind of last Friday's attack in the French capital unclear. 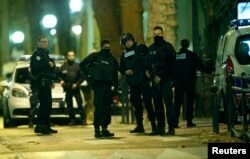 A government spokeswoman announced around midday the raid at an apartment in Saint-Denis was over. Authorities said they were seeking Abdelhamid Abaaoud, a Belgian national of Moroccan descent, but did not immediately confirm if he was in fact at the site. The Paris prosecutor's office issued a statement saying the dead included a female suicide bomber who blew herself up. Three police officers were injured and a police dog was killed during the operation. Authorities are also looking for other suspects tied to the November 13 attacks that killed 129 people and injured more than 300 others. The officials said that fugitive has not been identified. 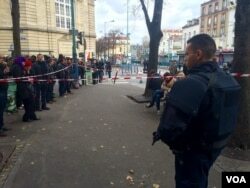 French and Belgian authorities have issued a warrant for another person, Belgian-born Salah Abdeslam, whose brother was among the attackers who died. Seven attackers died that night, three around the national stadium, three inside the Bataclan concert venue, and one at a restaurant nearby during attacks. Authorities believe that about 20 people were involved in planning and carrying out the attacks. French special police forces secure the area as shots are exchanged in Saint-Denis, France, near Paris, Nov. 18, 2015. The Islamic State group has claimed responsibility for the attacks, and U.S. Secretary of State John Kerry said Tuesday the militants "will feel even greater pressure" in the coming weeks as the United States, France and other allies increase their efforts against them. 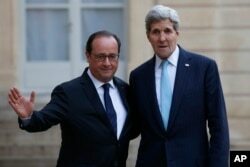 Kerry spoke in Paris after meeting with French President Francois Hollande. The French leader is due to meet with U.S. President Barack Obama in Washington November 24 to discuss ways to ramp up the campaign targeting Islamic State. French President Francois Hollande, left, and US Secretary of State John Kerry, pose upon arrival at the Elysee Palace, in Paris, France, Nov. 17, 2015. They will discuss U.S. efforts to assist in the investigation of the attacks and further cooperation among the U.S.-led, anti-IS coalition, the White House said, adding, "This visit will underscore the friendship and solidarity between the United States and France, our oldest ally." "We are absolutely committed to increasing our efforts in every degree possible, and thoughtfully, carefully," Kerry said. Chris Hannas contributed to this report from Washington.